John Urciuoli and R Kirt Hall scored 0.34 masterpoints with a 53.55% game at In Tempo Bridge Club. See full results of this game. Kim Corbin and Edward Schwartz scored 0.38 masterpoints with a 56.93% game at Bridge On Shea. See full results of this game. Kim Corbin and Edward Schwartz scored 2.21 masterpoints with a IMP game at Bridge On Shea. See full results of this game. John Babb and Dennis Mitchell scored 1.67 masterpoints with a IMP game at Bridge On Shea. See full results of this game. Norm Lynn and John Babb scored 2.48 masterpoints with a ★64.34%★ game at Bridge On Shea. See full results of this game. 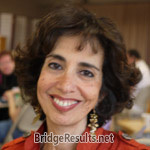 Kim Corbin and Edward Schwartz scored 0.75 masterpoints with a IMP game at Bridge On Shea. See full results of this game. John Babb and Dennis Mitchell scored 1.23 masterpoints with a IMP game at Bridge On Shea. See full results of this game. Kim Corbin and Edward Schwartz scored 0.33 masterpoints with a 53.74% game at Bridge On Shea. See full results of this game. Dennis Mitchell and John Babb scored 0.66 masterpoints with a 53.06% game at In Tempo Bridge Club. See full results of this game. Kim Corbin and Edward Schwartz scored 0.44 masterpoints with a 57.17% game at Bridge On Shea. See full results of this game. John Babb and Dennis Mitchell scored 1.57 masterpoints with a 58.74% game at Bridge On Shea. See full results of this game. Kim Corbin and Edward Schwartz scored 0.60 masterpoints with a 53.68% game at Bridge On Shea. See full results of this game.